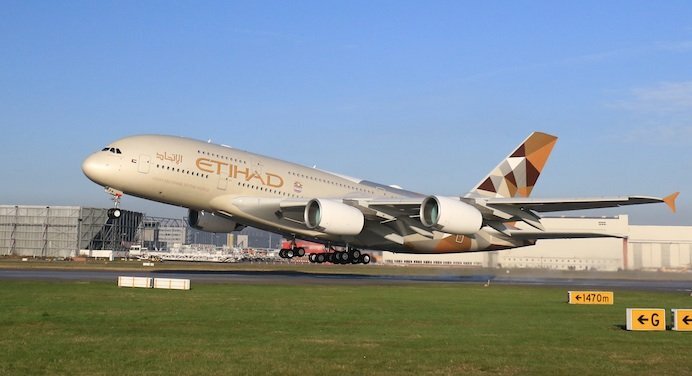 Abu Dhabi’s Etihad Airways has announced plans to launch an additional A380 service to New York’s John F. Kennedy International Airport citing passenger demand. The carrier said its second A380 service between Abu Dhabi and New York would begin on June 1 2017. It will replace the Boeing 777-300ER currently serving the route. Etihad began A380 services between JFK and Abu Dhabi in November 2015. “The response we have received from Etihad Airways guests traveling between Abu Dhabi and New York since we launched the service nearly a decade ago has been phenomenal, and we are delighted to further expand our world-class product for all guests traveling to and from New York,” said Etihad chief executive Peter Baumgartner. The second A380 will feature Etihad’s luxury three-room suite The Residence, as well as nine first class seats, 70 business class seats and 415 economy seats. Etihad first began daily non-stop services to New York in October 2006. It currently offers 45 weekly return flights between Abu Dhabi and six US cities. Yesterday Etihad said it and its equity partners would support 108,000 jobs in the US this year, following claims of unfair competition from US airlines.